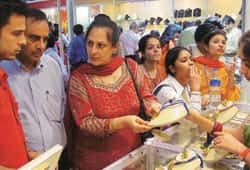 New Delhi: Jewellery shop owners are laughing all the way to the bank even as organized retail reels under an economic slowdown and slower customer spending. The Retailers Association of India, an industry lobby for branded retail chains, has said organized retailers will register only around 15% growth in sales against the 35% annual growth clocked in the past three years. Jewellers say the collapse of stock markets and the real estate slowdown have prompted most retail investors to divert funds into gold, diamonds and other precious metals and jewellery. “It’s a safer bet," said Irfan Munshi, India country head for Damasy Retail Jewellery Pvt. Ltd, a company that operates a chain of 17 stores across the country. “Gold has sustained its growth in all the turmoil around. So, people are safely removing their investments from stocks, etc., and investing them in gold and jewellery." Mumbai-based Gitanjali Group said its same-store growth between April and November has been 25%, and according to chairman Mehul Choksi, sales in the newly opened stores were up 75%. The group operates some 125 stores in India and sells through at least 3,000 outlets. Similarly, Mumbai-based KG Popley and Sons said it expected its sales to grow 40% in 2008-09. “It hasn’t been bad for us so far, fortunately," said Rajiv Popley, director of the chain. While investment in gold is not unusual in India, analysts said there has been an extraordinary rush in investments in the metal in the past few months. “This particular trend (of people investing in gold) has been observed especially in the last six months as people were shocked because of the unprecedented fall in stocks," said Mandar Pote, research analyst for bullion and metals at Mumbai-based brokerage Angel Broking Ltd. He pointed out that gold has traditionally been seen as a safe investment option. “In such situations, investors invest in gold as a safe option," Pote said, adding that gold consumption in India for the fiscal ended March was 769 tonnes, which is likely to go up to 800 tonnes in the current fiscal year. India’s bellwether Sensex, index of the Bombay Stock Exchange, has slipped some 52% since January and many retail investors have lost crores of rupees in the meltdown. Meanwhile, gold prices have declined marginally to around $812 (about Rs38,800) per ounce compared with $833 on 31 December. Gold prices dipped to as low as $681 in October. Since October and November are festive and wedding months in the country, sales of gold jewellery went up tremendously during the period. “Unlike gold, the share market has fluctuated too much in the recent months," said T. Shanta Kumar, managing director of Coimbatore-based Kirtilal Kalidas Jewellers Pvt. Ltd.